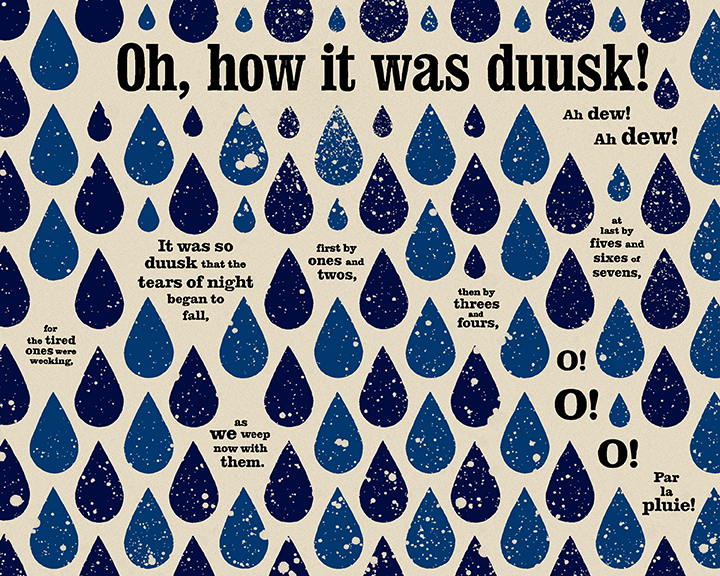 Wake In Progress: Page 159: oh, how it was duusk! I’m going to finally get to the end of the Mookse and the Gripes. Three more pages! Your works have often intersected with particular ideas I've had about the Wake. I'm finishing up an exceedingly long blog post about John Bishop's interpretation of ALP. Going to include one of your pieces (with full credit of course) in there that's highly relevant to the topic. The letter "O" in the Wake, besides having the appearance of a drop of water, also suggests the French "eau" meaning water. Thank you! Let me know when your post is up.